After Hyderabadi biryani, one more dish that is also very popular and famous like biryani is Hyderabadi mutton Dalcha . Using bone meat in dalcha make the dish more flavorful because of the juice that extracted from bones make the dish tastier. Fresh mutton half kg cut in small equal size. 1 cup of soaked Bengal gram (chana dal). Red lentil soaked (masoor dal) – half cup. 4 small size onion sliced. Black cardamom – 3 pieces. 2 Cinnamon sticks small size 1-inch. Fresh mint leaves chopped -1 cup. Freshly chopped coriander leaves -1 cup. Cumin seeds roasted powder 2 tsp. Take tamarind ball and soaked in water for 20 minutes. Use strainer to extract the juice. Use your hand to squeeze the tamarind and extract the juice. First wash split Bengal gram, and red lentils 2/3 times in a running water. Use a pressure cooker to cook the dal add thrice the quantity of water. Cook up to 6 whistles.and wait till pressure reduce. Mash the cooked dal properly and prepare the fine paste. Heat oil in a thick coated frying pan/Pressure Cooker and add all the dry garam masala one by one (black & green cardamom, cloves, and cinnamon) and sauté it in a low flame. Next, add chopped onion and sauté in low flame till it turns golden brown. Once onion is done add ginger garlic paste and sauté in low flame for 2 minutes. Next, add mutton and mix it well and sauté the mutton for 5 minutes in high flame. 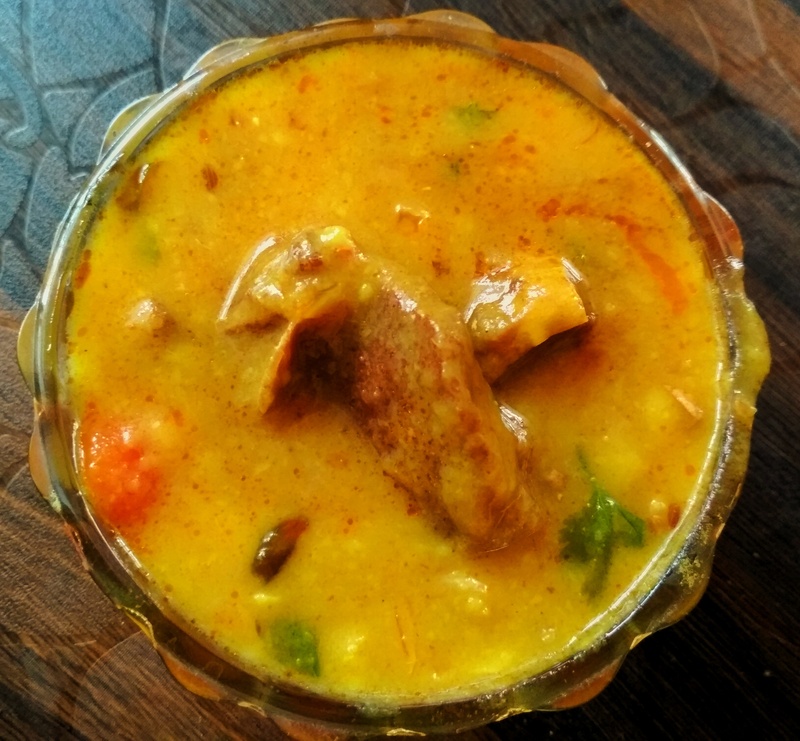 After 5 minutes when mutton changes its color add coriander powder, turmeric powder, red chili powder, chopped green chili, chopped tomatoes, garam masala, and salt to taste and sauté the mix in low flame for 2 minutes adding 4 cups of water. Once its done add cooked dal and cook in low flame until the dal is well incorporated into the gravy properly. Take separate pan for preparing the seasoning. Heat Desi ghee in a pan and add tamarind pulp, curry leaves, cumin seeds, coriander powder, cumin seeds and dry red chili and sauté it in low flame for 3 minutes. Add this seasoning to the dalcha. Cover the pan and cook for more 5 minutes. Your dish dalcha recipe is ready to serve garnished with chopped mint and coriander leaves.